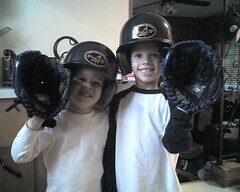 The boys are all set and on their way out to their first tee-ball practice! They look ready for the Round Rock Express farm team, at least. Thanks for sharing! I'll get the bases set up soon!